The Staatsbrücke ("State Bridge") is the most important and most prominent bridge in Salzburg. It links the Altstadt (Old Town) on both sides of the Salzach River between the Rudolfskai/Altes Rathaus and the Platzl/Linzergasse area. The site of the Staatsbrücke has been occupied by bridges for a very long time. In fact, the current Staatsbrücke is already the 10th bridge here. The first bridge recorded for this site was destroyed in a flood in 1090. The second bridge suffered the same fate in 1316. The third bridge was made of stone in the 14th century and was more refined than the previous two bridges; it had a roof. The fourth bridge might have been an upgrade of the previous one with the roof; it contained several shops and market stalls, alongside with the toll office of the Prince Archbishop. It was particularly popular with butchers and other food processors, because it was easy to dispose of wastes from here (by just dumping them in the Salzach). This fourth bridge was damaged by fire in 1512. The fifth bridge was a re-built version of bridge number four, but it saw frequent modernisations and two devastating floods in 1568 and 1598. After both events, the bridge was altered; after the latter, the bridge was so badly battered that only a simple wooden bridge was built to allow traffic. All these bridge were slightly upstream of the current Staatsbrücke; only bridge number 6 was the first one at precisely the modern site. This sixth bridge was built with funds provided by Prince Archbishop Wolf Dietrich von Raitenau and decorated with metal flags and coats of arms, but lacked the market stalls of previous bridges. Originally, it had seven pillars. Since this provided a barrier for passing ships (which were crucial for the transport of salt and other goods), the number of pillars was decreased to only four. This proved to be too much for the static performance of the bridge: It bended and was about to collapse. Thus, the bridge had to be re-built once again. Bridge number seven was due to be built in 1608, but this was a time of political turmoil: Prince Archbishop Wolf Dietrich von Raitenau was arrested by his successor Markus Sittikus in 1612. Markus Sittikus brought the construction work to an end. One already existing pillar was demolished and a simpler bridge number eight was built. In 1620, the new Prince Archbishop Paris Lodron extended and modernised this bridge, which also had a roof (no market stalls, though). This bridge proved to be rather lasting, even though floods were still a recurring thing and one particularly bad flood in 1786 led to the destruction of the roof. Nevertheless, the eight bridge survived until well into the 19th century. In 1877, a new bridge was built - in a way that was already very similar to the current Staatsbrücke, based on a skeleton made of iron. A bridge that is almost the same model as this bridge number eight can still be seen in the nearby town of Oberndorf today. This bridge was funded with public money - hence the name "Staatsbrücke" (which can also be translated as "public bridge"). Despite of the modern design and the massive base pillars, the ninth bridge could not cope with the increased demands of car traffic that emerged in the 20th century. In 1939, the construction of the tenth bridge started, the current Staatsbrücke. The construction work continued throughout the war, often with the help of slave labourers from Eastern Europe - a fact that was only recently commemorated by a plate with an inscription pointing out the fate of these Nazi victims. 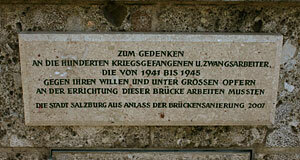 The bridge was completed after the end of the war and opened in 1948. The Staatsbrücke is 80 metres long and 20 metres wide. It is one of the busiest bridge of Salzburg. In 2007, the Staatsbrücke was renovated extensively.